Tigre is a district made up of the following neighborhoods: Benavidez, Tigre, General Pacheco, Dique Lujan, El Talar, Don Torcuato and Lopez Camelo. Tigre is located in Northern Greater Buenos Aires, 31 km away from the City of Buenos Aires. Tigre is a coastal city on the North-East shores of Greater Buenos Aires, or the Southern shore of the "Rio de la Plata" (Silver River). 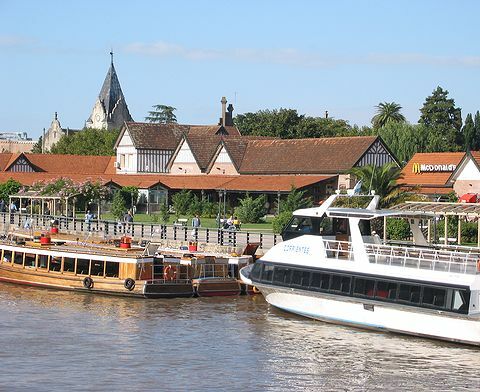 Asides from serving as a link between the City of Buenos Aires and the Delta, Tigre is by itslef a favorite weekend goal for locals and it is one of the most popular spots for tourists in all of Argentina, because of its colse location to the City of Buenos Aires. One of the things that attracts most people to Tigre is the "Puerto de Frutos" (Fruit Harbor), where you will find a large variety of small stores selling all kinds of ornaments for the house, garden, and personal use. Tigre is at about 30 KM away from the City of Buenos Aires, and the trip can be made by car, bus, or train. Before reaching Tigre you will come across San Isidro, an area with lots of parks, colonial buildings including a beatiful Cathedral that is also worthy of a visit.